With the holidays just around the corner, finding creative holiday gifts for kids can be a challenge. Microscopes make great educational gifts for kids. Below you will find our four top choices for children's microscope gift ideas. 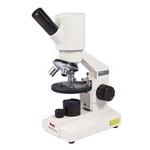 The 109L microscope is available either as a cordless model or corded. This microscope has 40x, 100x, and 400x magnification. Perfect for kids ages 6+, this microscope has glass optics and both coarse & fine focusing, making it easier to get a crisp and clearly focused image. The microscope is perfect for viewing pond water, or one of the ten prepared slides that comes free with the microscope. The microscope also includes a DVD "Adventures with a microscope", access to our Educational Resource Library with activities and print-outs for kids to use with the microscope, as well as blank slides and cover slips to create their own specimens. The D-EL1 digital microscope is perfect for capturing images, or viewing them live on the computer. The built-in LED light illuminates insects, coins, or anything else the camera is magnifying. The included software allows you to capture and save images for future reference on the computer. Camera includes a metal stand (as shown). Model 185 microscope offers 20x magnification and requires no additional light in order to view specimens. This microscope is perfect for children ages 5+. It's a great microscope for viewing insects, flowers, currency - anything that you can hold in your hand, but want to see in a bit more detail. Newsprint is especially fun to look at under the microscope, as you can view the small dots of ink on the paper. The DM52 digital kids microscope makes a great holiday gift. This microscope has 40x, 100x and 400x magnification. It can be used as a stand-alone microscope, or it can be hooked up to the computer. The included software allows you to view a live image on the computer, capture and save images and even make measurements. The microscope includes the following free accessories: DVD "Adventures with a Microscope", prepared slides, blank slides and access to the customer educational resource section of Microscope World's website.